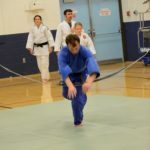 ASHI-WAZA – Leg or foot technique. 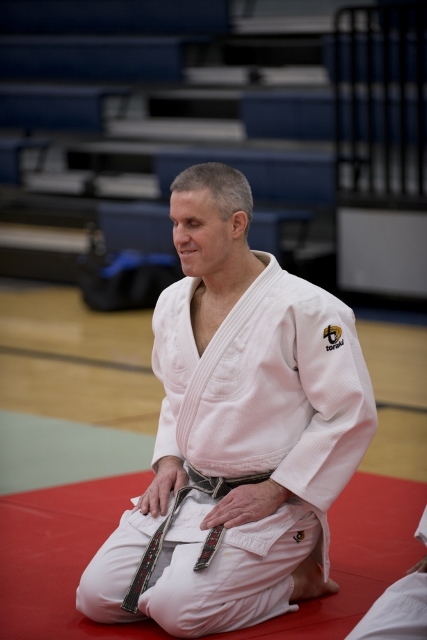 DAN – `Leader` grade, generally a black belt. DO – (a) Way or path. This word was used in Chinese & Japanese philosophy in the sense of the way of doing an act in the moral and ethical sphere as well as the simple physical. Professor Kano (the founder of Judo) `borrowed` it from these sources. (b) Trunk of the body. DOJO – Hall or room in which Judo is practised. ERI – Collar of a jacket. HAJIME – Start, referee’s call to commence a contest. HANSOKU – Disqualification (penalty; equivalent to ten points). HANTEI – Judgement, the referee’s call at the end of a drawn contest calling on the corner judges to indicate who in their opinion was the better of the two contestants. IPPON – One point (score value of 10 points). JU – (a) Soft, gentle. This word is taken from Taoist philosophy and embodies the opposite of hard, extreme, unreasonable. Hence the use of ju in Judo does not imply soft (as the synonym of easy) but rather reasonable, efficient. Physical action in Judo is not meant to be easy (weak) so much as economic, by using the body to its best advantage and taking active advantage of any and all weaknesses the opponent may offer, so that maximum effect can be attained with maximum efficiency. (b) Ten. JUDO – A form of wrestling in which clothes are worn by the contestants. The clothes and belt (encircling the waist twice) allow for greater range of technique. 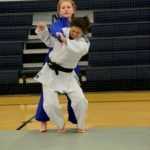 The depth of Judo in the use of tachi-waza (techniques done in the standing position) and ne-waza (techniques done in the groundwork position) requires skill plus physical and mental fitness being increasingly raised to an extremely high standard. In promotion examination (grading contest) no allowance is conceded to size and weight; success depends solely on the individual’s attributes – skills, physical and mental training standards. JUDOGI – The clothes worn when practising or competing at Judo. JUDOKA – A person who practises Judo. KODOKAN – the headquarters of Judo in Japan (Tokyo). KYU – A Judo `student` grade. MON – Gate, junior grade. 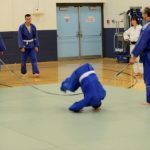 NE-WAZA – Technique done in a lying down position. OSAE-KOMI – Holding (e.g. osaekomi-waza – holding technique), referee’s call signalling the timekeeper that a hold is on. SHIAI – Contect. SHIDO – Note (penalty; equivalent to 3 points). SONOMAMA – Freeze, do not move. SORE-MADE – That is all (referee’s term to signify end of contect). SOTO – Outside, outer (e.g. osotogari = major outer reap). TACHI (v. TATSU) – To stand. TACHI-WAZA – Techniques done in a standing position. TATAMI – Rice straw mats used in dojos and Japanese houses. TE – Hand (e.g. 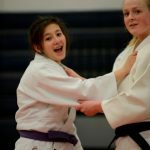 te-waza = hand technique). TOKETA – Hold broken. A command given by a referee to indicate to the timekeeper, the conetstants and the onlookers generally that a contestant has effectively broken the hold that he was being secured by. TORI (v. TORU) – (a) The name used often in technical explanation for the person who throws. (b) To grasp, to hold in the hands. 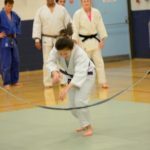 UCHI-KOMI (v. UTSU) – To beat against. A repetitive exercise where the throwing techniques is taken to the point of kake. UKE (v. UKERU) – To take. The name used often in technical explanation for the person who is thrown. 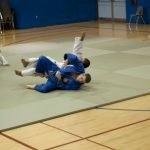 WAZA-ARI – A score, almost an ippon (score value of 7 points). YOSHI – Carry on. A referee’s instruction to contestants to carry on with the contest. YUKO – A score, almost a waza-ari score value of 5 points). Who posted this? It’s great! I was going to do something similar but I was beaten to it. I did if found it on a site and i decided it was a good thing to make a page for!